Street View Table setting looking into kitchen Kitchen Kitchen Dining area Grand Room Grand Room Bedroom 2 Screened in Porch Plenty of stemware Deck Community Swimming Pool Community Pickle Ball Courts Coffee Station Flat top stove Community Tennis Courts Community Golf Course New clubhouse pub /grill / 19th hole, good selection of local brew Beautiful granite counters ready for your food prep Desk area...if you need to do work. This comfy, cozy home is located in Connestee Falls private community and 15 minutes to downtown Brevard. It is also an hour from south-west of downtown Asheville, an hour to Asheville Regional airport. 45-minute drive to Greenville, South Carolina. Location, Location, Location! It’s all about the location with Home-Away-From-Home Vacation rental. This single level home is located in the highly-coveted area in Connestee Fall right in the center of it all, steps away from the clubhouse, tennis courts and golf course. You can cook dinner, watch TV and enjoy your family with the open floor plan, that provides a comfy family feel while on vacation. Step outside into the screen porch to enjoy a bug free evening. 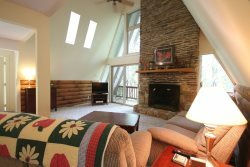 From the screen porch, you can walk out onto an open deck, you will be surrounded by forest. Despite being in the center of it all, the natural beauty of Connestee Falls unfolds with a wide variety of trees and wildflowers. Location! The water pressure in the showers was terrific too! !